PORTHOS is a small, rugged, lightweight, highly sensitive multiple chemical agent detector and identification system. PORTHOS incorporates Block's M140 sensor along with MESH's recognition software and has detection capabilities comparable to the Northrop Grumman MCAD system. It functions day or night and is capable of either short or long term military or Homeland Security ground or air operations. 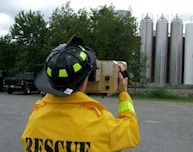 Within seconds it detects and presents to the user the name of a dangerous chemical vapor at distances of 0.1 to 5 km. Stored data includes raw interferograms, alarm type and time. The unit has both automated self-calibration and status monitoring of all critical points. It is available in both 0.5 and 1.5 degrees field of views. One important feature of the PORTHOS is that the chemical detection processing is done "on board" within the PORTHOS electronics and only a low bandwidth detection signal need be sent to a command/control center or recorded on board. 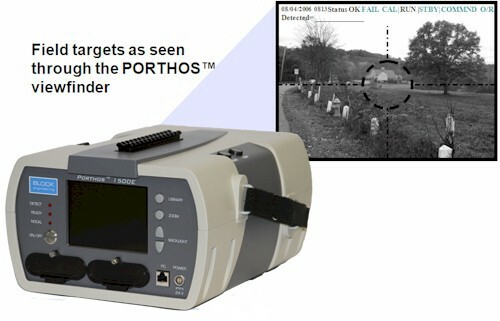 PORTHOS detects and identifies all the Military C-Agents (Nerve, Blood, and Blister) required of the JSLSCAD system and has been tested against the full list of military interferents. The following lists of TICs have been programmed and tested in a chamber: Ammonia, Boron Trichloride, Phosgene, Nitric Acid, Sulfur Dioxide, Arsine, Boron Trifluoride, Carbon Disulfide, and Hydrogen Cyanide. Additional chemicals can be programmed as needed. For a detailed PORTHOS brochure, please click here (PDF). If you would like to discuss how PORTHOS can help with your application needs, please contact us.